H.R. Chupurdy was a Yugoslavian immigrant who established his own automobile coachworks in Manhattan in 1912. The firm’s small 221 West 53rd St. shop was located just off Broadway in the heart of Manhattan’s Automobile Row, and specialized in bespoke coachwork and interiors for high-end chassis. His business partner, P.R. DeBracke, was also invested in another Manhattan auto body builder, the Empire Auto Body Co. That firm was incorporated on March 21, 1921 for $10,000 by; J. Hymowitz, P.R. DeBracke, M. Smolowitz and was located in the Bronx at 1708 Webster Ave., New York, New York. After he left the employ of Locomobile, in 1922 deCausse set up a Manhattan consulting business similar to LeBaron's, that designed custom bodies for Manhattan dealers engaged in the sale of high-quality imported and domestic chassis. As he did not have an actual shop of his own, deCausse commissioned small Manhattan coach builders like Chupurdy to produce bodies to order, to which he affixed a ‘Body by DeCausse’ nameplate. Chupurdy’s W. 53rd Street shop was located a couple blocks south of deCausse's design studio which was located in the Fisk Building at 57th Street and Broadway. 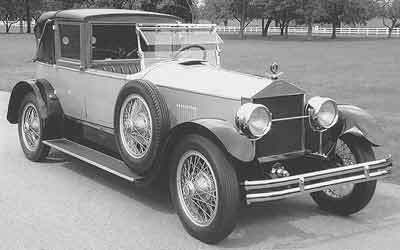 The New York City Roamer dealer also used Chupurdy for their custom bodies and in 1922 ordered a beautiful aluminum landaulet - a town car with a convertible roof over the rear seat – for a 136-in. wheelbase 1921 Roamer Model 6-54 chassis. The Kalamazoo-built automobile included a 54-hp, six-cylinder Continental Red Seal engine mounted behind a nickel-plated radiator shell that paid homage to similar devices found on Rolls-Royce automobiles. Although the chauffer of the formal vehicle was forced to drive in the open air, his employer rode beneath a collapsible leather roof luxuriously upholstered to conceal the inner workings of the convertible top. 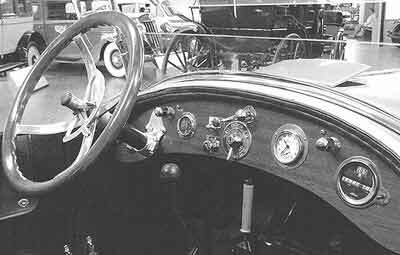 A nickel-plated speaking tube connected the master and servant, and when the top was raised two tiny round peepholes provided ambient light and rearward vision to the rear compartment. 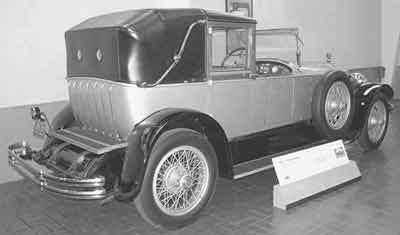 The Chupurdy-bodied 1921 Roamer Model 6-54 described above still exists and is in the collection of the Gilmore Car Museum of Hickory Corners, Michigan. Chupurdy is also known to have bodied the entire output of the Barbarino Motor Car Corporation, a firm founded by an Italian immigrant named Salvatore Barbarino in 1923. Barbarino (b.1886-d.1960) was a well-known racecar mechanic and driver who had worked with the Chevrolet Brothers racing team during the 1919 and 1920 Indianapolis 500. Barbarino was the designated relief mechanic/driver in the 1919 race for the Frontenac team who fielded four drivers, Louis & Gaston Chevrolet, Joe Boyer and R. Mulford. During lap 103 Louis Chevrolet's Frontenac lost a wheel in front of the grandstand and was able to return the broken car to the pits. After a 30 minute repair the car returned to the race with Barbarino at the wheel. In the meantime Joe Boyer’s entry had been sideline and he took over from Barbarino finishing the race 7th overall. Barbarino was Louis Chevrolet’s designated relief driver in the 1920 race. The pair piloted the Frontenac-based ‘Monroe Special’ placing 18th after a broken steering knuckle on lap 94 put the car out of contention. Following his brief racing career, Barbarino returned to New York where in 1923 he headed a group of investors who purchased the assets of the Richelieu Motor Co. reorganizing it as the Advance Motors Corp., of Stamford, Connecticut. Barbarino hoped to produce a high quality vehicle and set about designing a LeRoi-engined 4-cylinder equipped with four-wheel brakes mated to a 110-in chassis fronted by a Bugatti-inspired nickel-plated radiator shell. Legal problems developed and the firm was reorganized as the Barbarino Motor Car Corporation, Port Jefferson, New York, in 1924. Barbarino fought with his new partners and left the firm shortly before production began. In January of 1925 the Barbarino made it debut at the Commodore Hotel’s Ballroom. 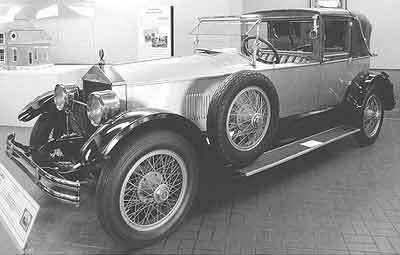 On display was a 4-cylinder stripped chassis, a phaeton and a sedan with a cabriolet-type rear quarter panel. All coachwork was to order and the bodies on display were built by the Chupurdy Auto Coach Works, 221 West 53rd St., New York, New York. Chupurdy is thought to have built the bodies for all 9 or 10 Barbarinos that are known to have been produced before the firm entered into receivership at the end of 1925. By that time Salvatore Barbarino had returned to his home in Flatbush, Brooklyn where he found work as brick-layer. He later operated his own auto repair shop and worked for a number of years as a longshoreman. H.R. Chupurdy remained in the automobile business, but did very little coach building after the mid-twenties. He found that re-finishing and re-upholstering used high-end imported chassis was much more lucrative and according to Robert D. Fishers 1944 Manual of Valuable and Worthless Securities, remained in business until 1936.